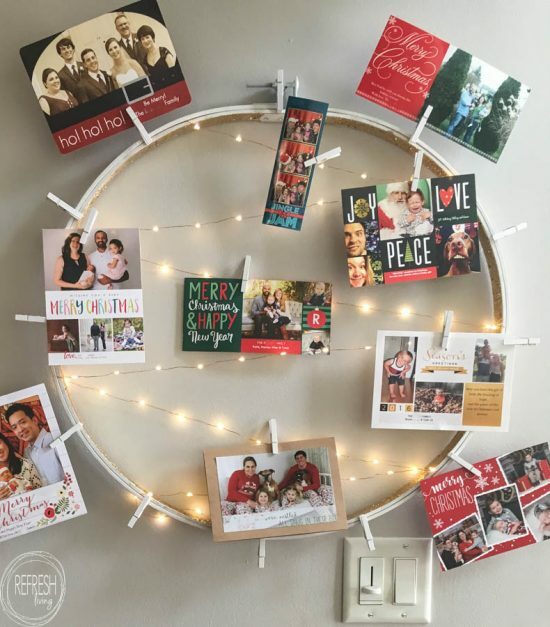 This DIY Christmas card holder is a solution to a problem I’ve had for years – what to do with all those Christmas cards that are sent to us every year. 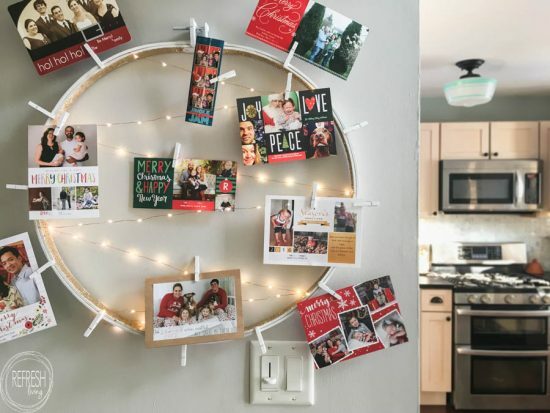 I love looking at Christmas cards, but I’ll admit that once I looked at them, they just went in a little Christmas box where only the first one was visible. All those other smiling faces were just hiding. I finally decided to solve that problem this year. 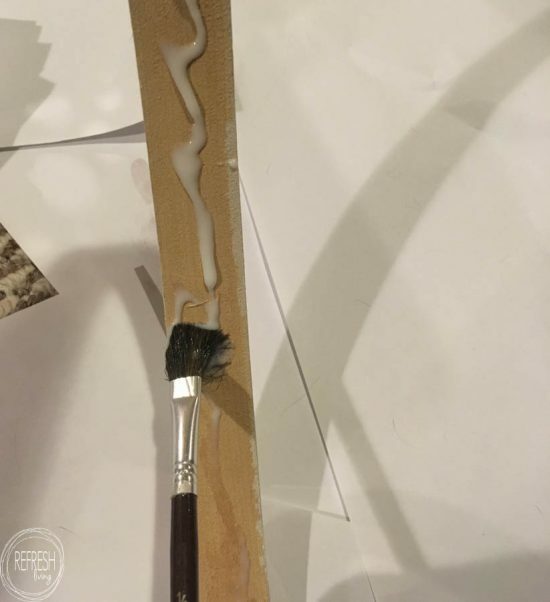 It was easy, quick, and I love the way it turned out! 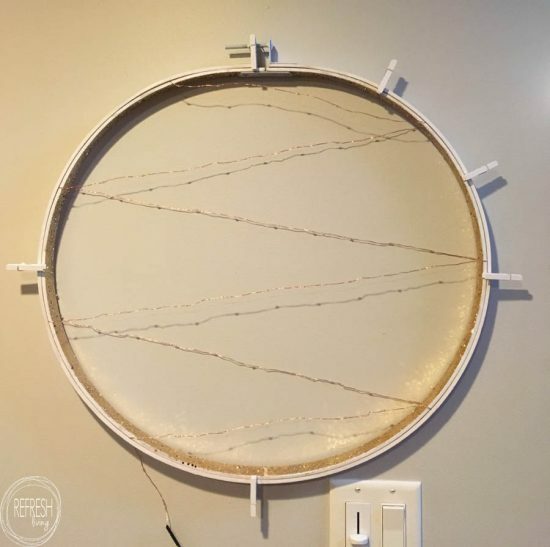 I started with a very large embroidery hoop I bought at an estate sale for a dollar (admittedly buying it without the slightest idea what I would do with it). But only $1? I just couldn’t pass it up. 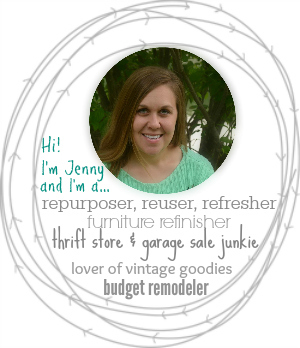 Mine is an 18″ hoop, which you can buy online, or probably at most craft stores, too. I kept the two parts of the hoop together and spray painted the front and outside edge with white spray paint. After it dried, I painted glue around the inside edge and sprinkled gold glitter along the inside edge. Glitter can be expensive, so whenever I see it at garage sales or on clearance I usually grab it (if I like the color). I bought these two bottles at Joann’s on clearance for $1.50 each, again not having any idea what I would do with it, but knowing I wouldn’t be able to find it that cheap when I actually needed it. Are you noticing a trend here? 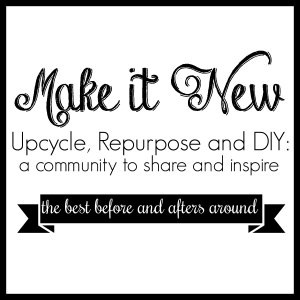 Is there a craft supplies hoarding anonymous group out there? I may need help. But in doing so I sure save a lot of money! After the glue dried I separated the two rings and wrapped copper wire dew drop lights around the inside ring. 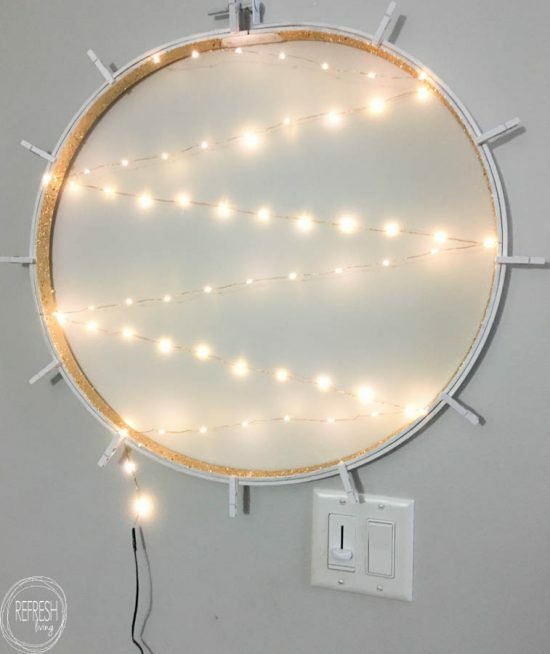 I used a piece of tape to secure the wire along the outside edge of the inner hoop, and I made sure that none of the lights were on this part, only the wire. My lights were 9.5 feet long and it was the perfect length for my hoop. I slipped it back into the large hoop and tightened it up. 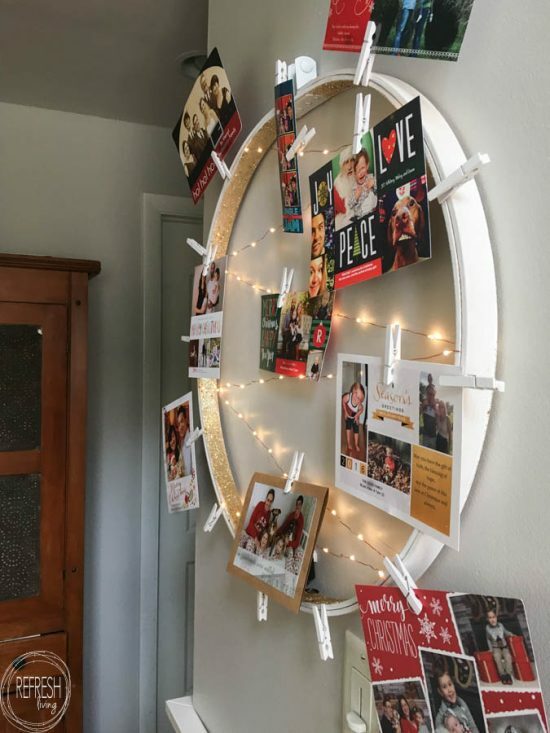 I hot glued little white clothespins to the outside edge of the hoop, and also used the same type of clothespins to hold the cards to the wires, too. 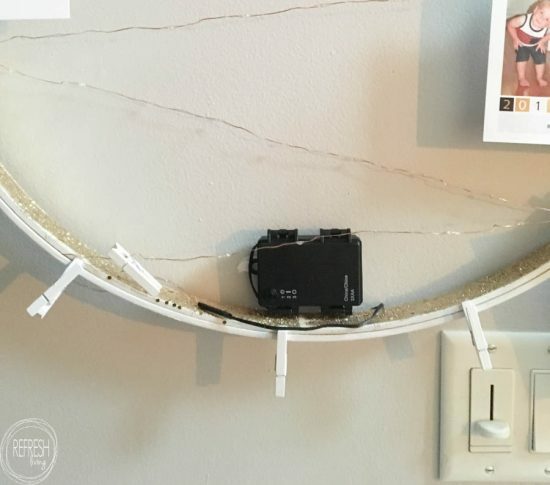 The battery pack was a bit of a problem because I planned to hang my hoop on the wall. 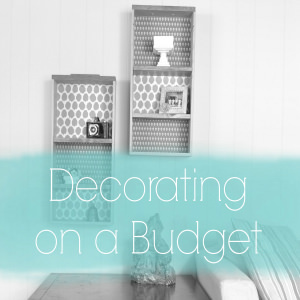 If you are planning to rest it on a mantel or dresser or something, you can probably skip this step. 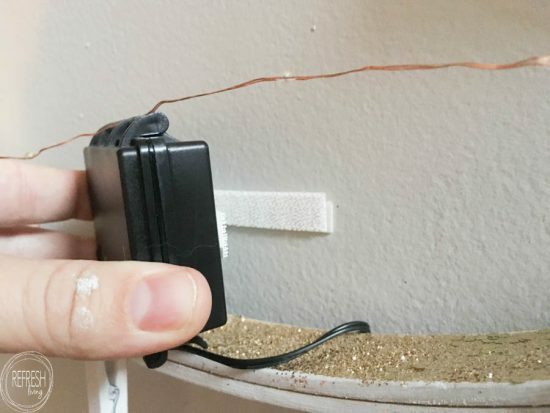 I just used a command strip to temporarily attach the battery box to the wall, resting of the bottom of the hoop for stability. I just love the light glow these lights give off, and the amount of space I have to hang up cards! 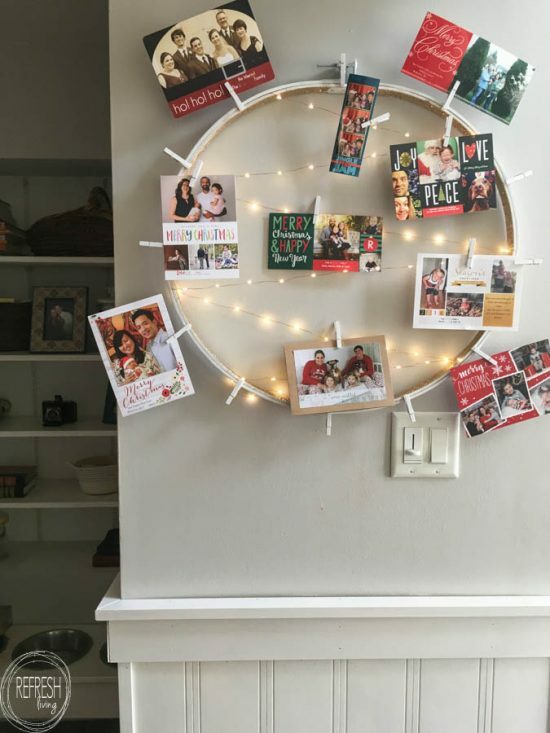 I just used a card (actually our Christmas card from this year!) to cover up the battery pack. We actually still haven’t sent out our cards yet. The thrifty side of me wants to wait a week or so to see if this baby comes before Christmas, so we can throw the birth announcements in the same envelope and save the stamps! 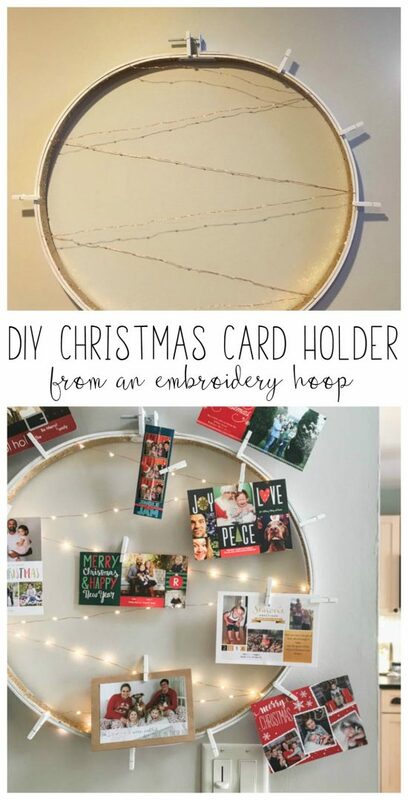 This is a really creative idea and a great way to display cards. I love the glitter on the inside. Great project. This is beautiful and I need a good way to display cards. Think I found it! Pinned. This is a really cute idea. I like it so much I not only pinned it to the link party board, but to my own Christmas board as well. Thanks for sharing at Over the Moon. We look forward to seeing what you have to share with us in the new year. I love the lights on it! So pretty. Oh I am loving this idea! This is gorgeous! I love it. 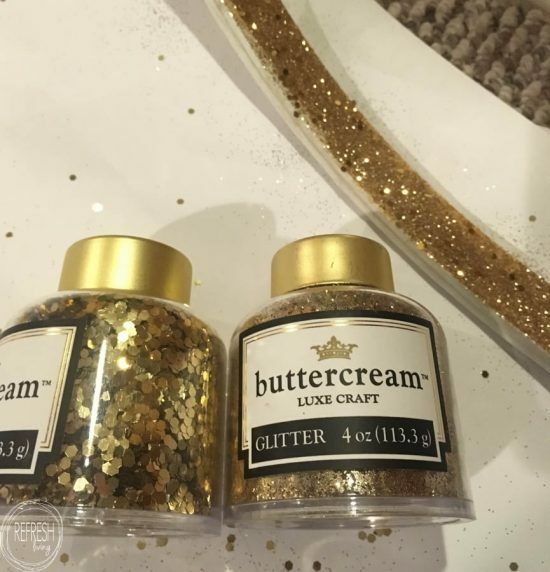 The gold glitter is beautiful. Thanks for sharing at Funtastic Friday. I don’t think I’ve ever seen a hoop that big. It looks beautiful!